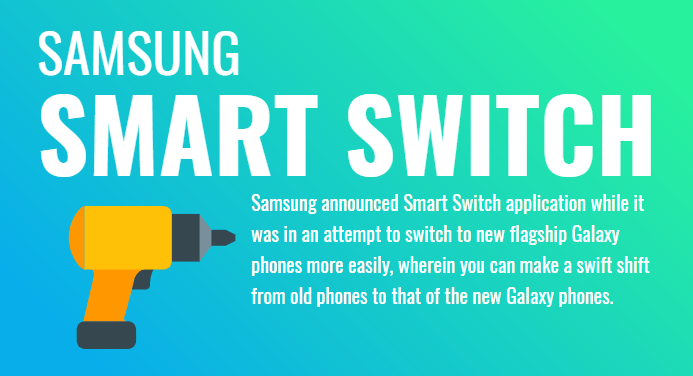 Samsung announced Smart Switch application while it was in an attempt to switch to new flagship Galaxy phones more easily, wherein you can make a swift shift from old phones to that of the new Galaxy phones. This process goes for almost every band, rather than just the old Samsung mobiles. Be it your old iPhone or Blackberry; the Smart Switch app works in a really awesome way. Samsung Smart Switch app behaves as a wonderful update tool that detects the connected Samsung galaxy device automatically. It can also find the corresponding updates available for the same. The Smart Switch app shall update your smartphone after the download has been successful. Samsung has always been known for providing an amazing customer experience, and Smart Switch program has been designed in such a way that it can work smoothly on iOS and BlackBerry devices as well. You can consider data acceptance and transfer via Samsung Smart Switch as it is compatible with a wide range of popular smartphones. From highlight brands like Apple and Blackberry to the usual Android brands, all work efficiently. You can install Samsung Smart Switch app both on a Macintosh or on a Windows machine. These iterations have identical features, and they work in an absolutely efficient way. The Smart Switch program will automatically install USB drivers once you have installed it on your computer. This would be really helpful since you no longer need to loiter across the internet fetching USB driver packages. For Windows: Samsung Smart Switch for Windows — Latest! For macOS: Samsung Smart Switch for macOS — Latest! Samsung KIES: To transfer contents from your Samsung Galaxy phone to your PC and vice versa, here’s another tool called the KIES. Download Samsung KIES. Samsung USB drivers: Newest USB drivers are shipped with the Smart Switch software. Thus, you do not require an independent download file. The latest Samsung USB drivers could be found here. Custom ROMs: Samsung smart Switch does not support installing custom ROMs. You cannot even opt for recoveries or custom kernels. Visit our Custom ROMs section for AOSP based ROMs.